[Editor's Note: The following was posted to Schools Matter by Jim Horn to Schools Matter on December 1, 2009 09:46:00 AM]. 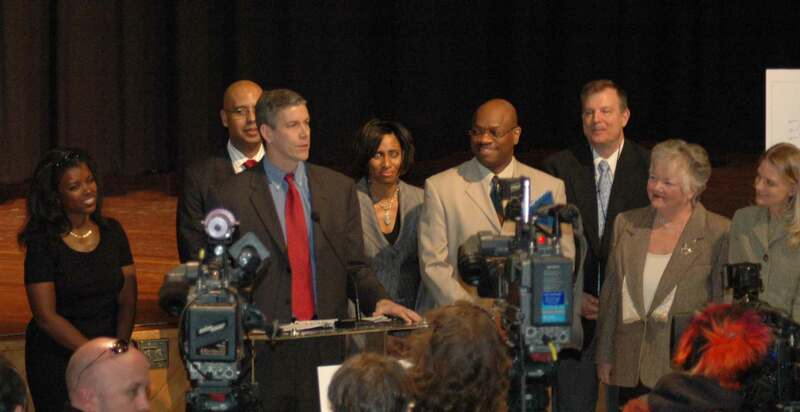 By April 7, 2008, when he spoke promoting the latest round of charter school "innovation" RFPs (Requests for Proposals) at what was left of Chicago's Englewood High School (above), then Chicago public schools CEO Arne Duncan had perfected several of the meaningless talking points which were to go national after President Obama appointed Duncan U.S. Secretary of Education eight months later. One of the most irrelevant bits of information that Duncan has now brought to the national stage is the claim that because charter schools have "waiting lists" that constitutes proof that there is a "market-based" demand for charters that has to be filled. At the above press conference, and at dozens of media events before and after it, Duncan refused to answer a simple question posed by Substance: "How big is the waiting list for Chicago's selective enrollment magnet elementary and high schools?" Duncan refused to answer the question, constantly repeating "I'll get back to you on that...", a dodge he invokes whenever he was avoiding answering a question. The reason the question was important, then and more so now, is that the claim that charter schools faced a "demand" based on the claim that they had a "waiting list" was never actually proved in Chicago. At the time Duncan was repeating the claim, over and over, the claim was then being repeated, especially in editorials in Chicago's pro-charter newspapers. But Duncan's refusal to provide the information on how big the "waiting list" was for specific Chicago charters was part of a pattern of deception. On a policy level, if there was a significant "demand" for the city's magnet schools and programs (which Duncan refused to provide by making public their "waiting lists"), the policy question then became: "Why not expand the city's magnet and selective enrollment public schools instead of putting millions of dollars into the expanding charter schools?" With the publication of the latest Hoxby study, Duncan's Chicago lie about the importance of "waiting lists" has gone national. Substance photo by George N. Schmidt.Better late than never, I guess. But too bad, really too bad, that Nick Anderson reports on the CREDO study by suggesting equal validity for the empirically-challenged Caroline Hoxby advocacy piece. Anderson treats the two as examples of just another "he said, she said" kind of ideological debate. If Anderson had bothered to read the two studies with an eye for comparing apples with rotten apples, he may have noted the alarm bells ringing over the Hoxby study, while the CREDO study notes reservations of the type that are common to this kind of large-scale longitudinal research. For Anderson to give equal weight to these two pieces of research is like saying that that the Creation Museum in Petersburg, KY is of equal scientific value to the Smithsonian Museum of Natural Historyin DC. The telling press release for the Hoxby review entitled "Headline-Grabbing Charter School Study Doesn't Hold Up to Scrutiny" with links to the study may be found here.The following is the concluding paragraph from the review, itself. As a result of the potential sources of bias and the lack of detailed information in the reports to assess the extent of such bias, it is not possible for this reviewer or other readers to determine the degree to which the estimated charter school effects in grades 4 and above are valid. Policymakers and educators should therefore not rely on these estimates until the bias issues have been fully investigated and the analysis has undergone rigorous peer review. Given the quality of the data, however, a revised version of the analysis could provide a more definitive answer regarding the effectiveness of New York City’s oversubscribed charter schools (p. 14). studies on student achievement in charter schools — that should be shared in the technical report. The review offers suggestions that we hope will help improve the subsequent reports produced by CREDO based on this multi-state data set (pp. 10-11). better on state exams than students who entered the same lotteries but did not secure charter school seats, according to a study by a Stanford University economist being released Tuesday.. .
Ah yes, the fairness and the balance of the corporate media — and this is the ultra-liberal NYTimes, mind you.